Make your own half-body, rod-arm puppets with our detailed pattern and DVD instructions. 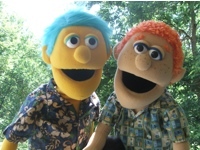 We show you step-by-step how to make quality puppets, including our unique, comfortable mouth design, and how to customize your puppets to your tastes and needs. Pattern includes list of tools and supplies, and sources to find those supplies. The cost is less than even one finished puppet, and you can use it to make many, many unique quality puppets. Pattern, notes and DVD -- $75, with free shipping. 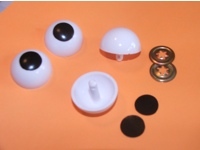 These are one of the options on your PJ's Puppet Pattern #1, and are hard to find in craft stores. Ours come with backs and adhesive pupils. 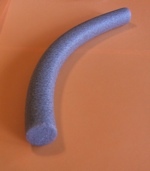 This material is used in the mouth of PJ's Puppet Pattern #1. A 3" piece is needed for each puppet. It's available at Ace Hardware stores, but if you prefer, you can buy it from us at $1.50 per foot, free shipping.